After touring some European cities like London, Berlin, Vienna, and others, Startup Rally arrived in Paris yesterday evening hosted at La Cantine. The event is being organized by Leto, a London-based agency specialized in creating websites and mobile apps and sponsored by Innovation Warehouse, a London-based accelerator for entrepreneurs, investors and innovators which delivered the winner’s prize: a 6 month membership to their offices and activities. 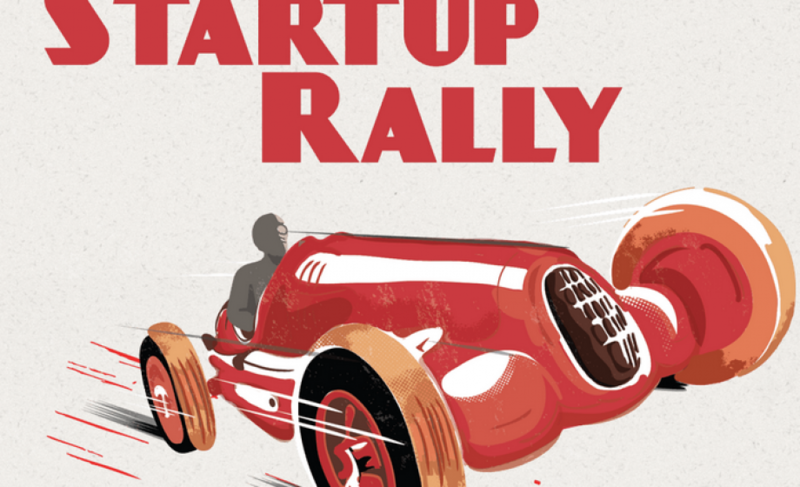 Startup Rally is a new concept born from the desire to travel but also to connect major European tech hubs, 4000km, 9 cities in 19 days for its first time. All along the Rally many startups hit the road as well, seduced by the idea of road rally meets investors feedback and possible fundings. There were some like Portfoleo or PixelPin who were there from the beginning and pitched in all cities. With a total of a bit more than 30 startups of 10 different nationalities competing so far, Startup Rally does a great job of building up a community and creating enthusiasm wherever they pass. The majority of startups pitched in 3-4 different cities (some even after winning the rally in one city) in order to increase their visibility, network, investor feedback and possible funding. This shows the potential of an itinerant startup competition as well as the interest in startups inside the European Union. Startups from cities like Dublin or Barcelona were intrigued by the absence of the Rally in their cities. As a first-time event, Startup Rally is so far a success even if there are things that can be improved (example: the winner gets free space at the Innovative Warehouse, if a startup wins twice, which happened, they get a bigger space, what happens if a startup wins 3 times or more? ). I chatted a little with Marina Hramkova from the Leto team during the event and she told me that the Rally is meant to be developed to other cities as well, as sponsors are contacting them in order to organize something bigger next year. She also mentioned the English and French startup ecosystems as being evidently more developed than in the other countries. But let’s talk about yesterday evening’s event in Paris at La Cantine. As usual, the event began late, this time because the jury wasn’t there yet. At 7pm, it opened with a short speech from Marina, followed by 40 minutes of 4 startups pitching 10 minutes each ( a 6-minutes pitch which is a lot of time and 4 minutes Q&A ), then a break followed by another 4 startups pitching. Well, it should have been 4, but for this second round there were 5 startups, a last-minute one managed to infiltrate the evening. It was all followed by the winner announcement around 9:30 pm. Youmood.me which aims to give everybody the possibility of making comments all around the web without having to create a profile each time for each site visited. Portfoleo is a hiring platform and creative database for architects. It solves the problem of creating portfolios especially designed for architects and simplifying the application system. Motosmarty is an app conceived for the community of bikers and their safety. It responds to the problem of knowing in advance any road hazards like damages and being able to avoid them, as well as inform the community about them. Betapp.co is a betting platform which aims to go viral in China as the Asian market is less structured by laws, thus more permeable. Videolean is a video platform simplifying the creation of videos. Using their service, anyone can create high-quality videos in 15 minutes. The service addresses small business owner, journalists, or community managers. Cryptosense is a service developing software tools for vulnerability management of cryptographic systems. They have received the French Ministry of Research “Creation-Developpement” prize this year. Pixelpin is another security service proposing to replace a password with a photo thus solving the problem of password vulnerability. They are mostly addressed to banks but also e-commerce and m-commerce owners. Feeligo is a new source of revenue for specialized social networks by providing them virtual gifts in according to their specialization. They launched in January 2013 and already have 200+ social networks interested in their service. Braineet presents itself as the first network to share your good ideas. You can share any idea with friends but they’re mostly aiming to get brands interested. On the whole Braineet offers a new place to talk to brands and receive rewards from them whenever your idea is useful to them. The winner of the evening was Portfoleo (UK), finally rewarded for their longevity and determination in the Rally, followed by Feeligo (FR) who came in second and Cryptosense (FR) third. The jury made some remarks about the pitches and gave a few pieces of advice. Unlike some other startups present in the competition, Portfoleo is addressed to a defined community (along with motosmarty), in this case the architects. The CEO himself studied architecture and was confronted with the difficulty of creating a specialized portfolio and contacting employers process. Portfoleo was born from the need to improve and ease an existing process, with an inside knowledge of the specific target. On the whole the CEO managed to explain the “why” so well vs the “what” that the jury couldn’t help but reward him. Startup Rally is indeed a good way of training and working on pitches, as this is something startups desperately need to improve in order to avoid answers like “Firstly because we are geeks” to questions like “Why are you particularly relevant ? “ as it happened at one point last night.